Never seen this before... they look kind of cute.. edible? they are a fun find, a fall forage with my grandmother. I see them more to the south of me. Ooh! I want to try some. We get wild watermelons growing all over around here, but I'm not a huge fan. I have neither seen nor heard of them. Interesting; now I will have to look them up as well. Have a happy day! Hi Lisa, my first visit here via Reana Claire's blog. 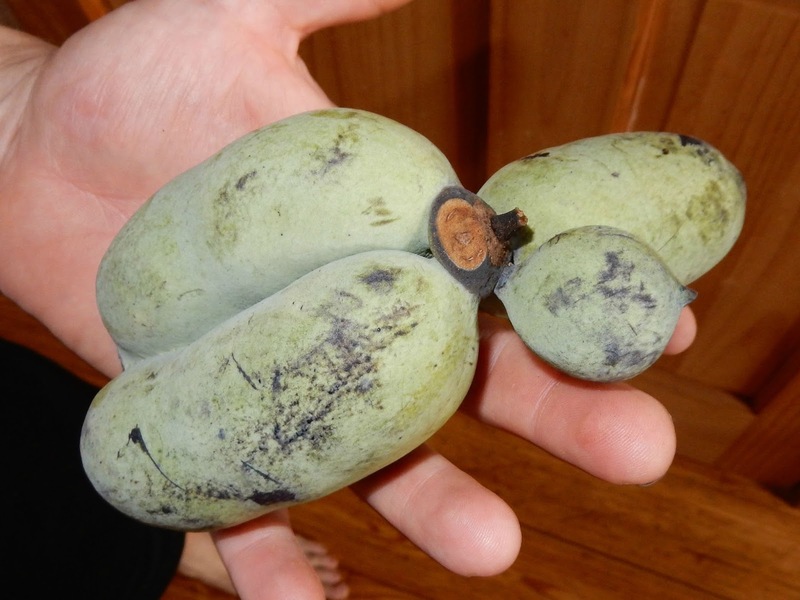 I have not seen this fruit before. I guess they do not grow in my country. In a way they do look like bananas. So they taste like papaya? I love papaya. You have a very interesting blog. I usually smell them before I see any, kind of a ripe banana smell as one walks through the woods. Of course the large leaves are a give away even when driving by the woods. My aunt was allergic to them but I haven't heard of anyone else being so. They have nice large seeds that look like they would make a good necklace. You want to keep any seeds that sprout out of direct sunlight. I always fail at Paw Paw planting. I've never even heard of them! Never heard of this fruit. Please share a photo of a sliced one next time. Wow, very interesting, I haven't seen them but I have heard about them. My friend started some from seeds and gave me two! I have had them in pots growing them up for over a year.. this fall they go in the ground. Funny I have now seen post on Paw paws twice in a week! I didn't realize they would grow in a much colder winter climate than ours. I hope mine will do good! have never seen them before! cool! My mom sang that to me when I was a little boy. I've never heard of them. I wonder if they grow in Nebraska. I'll have to look it up. That is very interesting,,,, we have never seen or heard of those things. Never heard of them until I saw Harry's comment...then it reminded me that I had indeed heard of them...but had NO idea what the heck they were. You sure have some weird stuff growing over there! It's really new for me. Your pawpaws look good! Our pawpaw harvest in Penhook, VA, only yielded about 2 dozen, and they were smaller than usual. I blogged about them here: http://peevishpen.blogspot.com/2015/09/pawpaws-2015.html. To get the seeds to grow, you have to scuff them up a bit. i feel there is a story about these trees. do they give fruit of some kind? i think maybe this is the tree that the hubby has spoken on before? we kayak all the time & i think we did smell something from them. i wonder if i am getting it confused with another tree? Neat! I don't think I've ever found any. Good luck getting them to grow. That would be really cool!